How can skipping a week of university classes possibly benefit serious students who are putting forth their best efforts to learn and hone their talents? 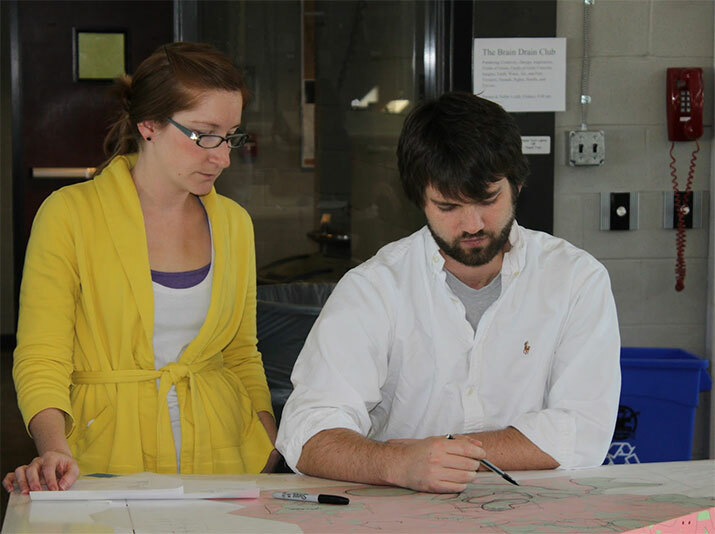 According to the head of Mississippi State’s landscape architecture department, setting aside departmental classes to focus on "Design Week" is a planned activity that provides an intense learning experience. It also previews the types of projects students can expect during their careers—and gives them a taste of future employer and client expectations, Sadik Artunc added. Dave Armbruster, a principal with internationally known landscape architectural planning and design firm EDSA Inc., recently joined MSU landscape architecture and landscape contracting majors alongside departmental faculty for a week-long charrette, the profession’s term for a concentrated period of design activity. Artunc said Armbruster challenged the students with a real-life resort development project his firm has been working on for about a decade. Graduate student Cory Lucius of Senatobia said just knowing the assignment was "real" provided a major incentive for students to take the work even more seriously. "This work is not going to sit on a shelf and collect dust," Lucius said. "It feels good to know that the work we’ve done is going to be utilized." To tackle the project, students were grouped in vertical teams including each level of undergraduate and graduate majors in the departmental programs. Together, they engaged in creative brainstorming and vetting of potential problems to produce a practical idea and presentation by the week’s end. EDSA specializes in resort development, and this project, set in St. Croix, U.S. Virgin Islands, included some intrinsic challenges, said Armbruster, a fellow of the American Society of Landscape Architecture. The island location includes an extremely steep landscape that does not allow for a traditional resort development, he explained. By the charrette’s conclusion, however, a series of eco-tourism ideas generated by the student teams were strong enough to be presented both to the development site owner and St. Croix government officials. "Dave was confident that ideas generated by our students have real-world implications and are feasible," Artunc said. He observed that students benefitted extensively from interactions with Armbruster, who currently directs EDSA’s eco-resort development studios. After working for the business throughout his career, the now semi-retired University of Florida graduate offers his knowledge, skills and abilities to various landscape architecture academic programs. Along the way, he also continues to identify talented prospective employees. Artunc said professionals such as Armbruster that bring their own experiences into the university setting are a great supplement to faculty teaching. "Students tend to pay close attention to visiting professionals who can confirm what we’ve been teaching," Artunc said. "We try to have practicing professionals come and visit our programs and students often, but this is a special opportunity to have someone with Dave’s experience to spend an entire week." Lucius said he and fellow students learned that they must think quickly on their feet because of time constraints when working with a client on deadline. "I think the charrette was telltale of what we can expect in a professional experience. But at the university, you feel free to take risks as you get creative in your design," Lucius said. While Armbruster praised the students’ solutions for the project, as well as their understanding of the topography for a site they had not visited physically, he also shared some constructive criticisms to advise them on how to improve tactics when facing future projects. Artunc said he hopes future Design Week projects can be done by forming interdisciplinary teams, possibly combining students from landscape architecture, architecture, civil engineering and other majors.